Each year, the ASABE recognizes companies and their investment in technology that is designed to help farmers everywhere. Annually, the American Society of Agricultural and Biological Engineers (ASABE) presents awards for the most innovative product-engineering designs in the food and agriculture industry. This year, John Deere has been recognized for its innovations with six awards from the ASABE, highlighting its continuous dedication to excellence in its respective field. 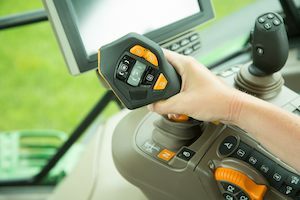 The CommandPro™ joystick for 6R Tractors, the Bale Mobile app, the 2660VT Variable-Intensity Tillage tool, and the tracks for S-Series Combines all received awards. A machine performance app that's part of its Generation 4 CommandCenter™ and the 700FD HydraFlex™ Draper also won awards from the ASABE. "This year's AE50 Awards reaffirms the innovative spirit of our employees and illustrates our company's commitment to bringing those linked to the land the most useful, high-quality products possible. Around the globe, John Deere engineers work tirelessly to create exciting new products and technology to benefit our customers," said Joel Dawson, director, production and precision ag for John Deere. The CommandPro joystick was released in August 2018, and is completely customizable to suit operator needs. The Bale Mobile app is specifically designed to help hay and forage producers. The 2660VT Variable-Intensity Tillage tool features an adjustable gang angle design and all-new frame to place the right amount of weight per blade to handle a wide range of conditions. Finally, three of the awards were for harvesting solutions. These were the suspension track system for S-Series Combines, 700FD HydraFlex Draper, and a Machine Performance app. More detailed information on all of the equipment and solutions that won ASABE awards can be found at JohnDeere.com.